The will of Mr. Henry Joachim, of 13, Airlie-gardens, Campden-hill, who died on July 21, has been proved by Mr. Harold Henry Joachim, of Highlands, Haslemere, the son; the Hon. Francis Albert Rollo Russell, of Dunrosal, Haslemere, the son-in-law; Mr. Emil Benjamin Joachim, of Gresham-buildings, Basinghall-street, the nephew; and Mr. John Knill Jope Hichens, of 41, Threadneedle-street, the executors, the value of the personal estate being £103,117 0s. 10d. gross, and £79,433 1s. 1d. net. 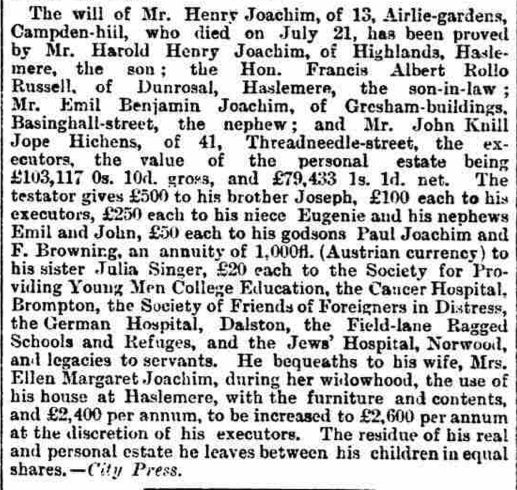 The testator gives £500 to his brother Joseph, £100 each to his executors, £250 each to his niece Eugenie and his nephews Emil and John, £50 each to his godsons Paul Joachim and F. Browning, an annuity of 1,000 fl. (Austrian currency) to his sister Julia Singer, £20 each to the Society for Providing Young Men College Education, the Cancer Hospital, Brompton, the Society of Friends of Foreigners in Distress, the German Hospital, Dalston, the Field-land Ragged Schools and Refuges, and the Jews’ Hospital, Norwood, and legacies to servants. He bequeaths to his wife, Mrs. Ellen Margaret Joachim, during her widowhood, the use of his house at Haslemere, with the furniture and contents, and £2,400 per annum, to be increased to £2,600 per annum at the discretion of his executors. The residue of his real and personal estate he leaves between his children in equal shares. —City Press. Heinrich (Henry) Joachim (ca. 1824 — July 21, 1897) was Joseph Joachim’s older brother. Involved in the family wool trade, he lived in London. Joseph Joachim stayed with his brother at 25 Phillimore Gardens and later 13 Airlie Gardens when in London.